DRM Elimination Crew activists in Dhaka, Seattle, Boston, and other cities around the globe took to the streets to raise awareness about DRM's harmful effects. 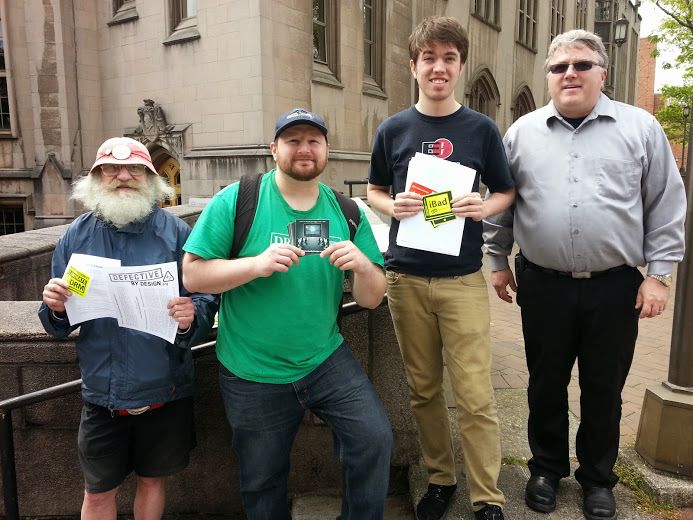 At the Boston action, supporters engaged passersby in conversation about DRM in front of a Best Buy, and then snuck a few flyers between copies of DRM-encumbered movies and games before heading to a local pub. The Electronic Frontier Foundation held an online teach-in. If you missed it, you can watch a recording on their site. Free Software Foundation Europe released an open letter to the executive body of the European Union. April, a free software organization in France, held a day of action too. Several online stores offered sales on DRM-free media, including O'Reilly, the Humble Bundle, No Starch Press, and Packt Publishing. How was your Day Against DRM? Send us your photos, blog posts, and videos and we might include them on the site! We'll be announcing the date for International Day Against DRM 2015 soon. To be notified when we set the date, and to make sure you hear about Day Against DRM events in your area, be sure to sign up for the announcement mailing list. International Day Against DRM is an important time to come together to show our strength, but the fight to eliminate DRM is year-round. If you want to get more involved in the grassroots effort to eliminate DRM, join the DRM Elimination Crew discussion list. The discussion list is instrumental in organizing the Day Against DRM, and helps the Defective by Design staff with ideas and on the ground support throughout the year.